1. It’s the longest bridge in America. Strung by hundreds of feet of cable, The Bridge of Prosperity is 4 feet wide and over 400 feet long (longer than a football field!). The bridge spans from the base camp at Foxfire Mountain across Dunn’s Gorge to Prosperity Mountain. Built in 2012, The Bridge of Prosperity was made with the ability to swing, but it is sturdy enough to be completely safe. The bridge is anchored at each end by over 30 tons of concrete and is capable of holding over 24,000 lbs. 3. It’s open for people of all ages. The Bridge of Prosperity is part of the family fun Bridge Adventure tour, which is open for all ages! It even includes an on-the-ground obstacle course for both kids and adult kids to enjoy. 4. There’s only a small fee! The Bridge Adventure is only $19.95 for adults and free for children under 8 (The Bridge Adventure is included free with the Bear Crawler Tour or Zip Line Tour)! A Wish Book and trail book is also offered. No reservations are required. Groups love spending time at Foxfire Mountain! With so many fun activities, it’s a great way to spend time together and take part in teambuilding activities. We can accommodate groups for any of our Foxfire Mountain adventures! We also recommend large groups take advantage of our group rates by filling out our contact form. Take a look at the video below to see what we offer at Foxfire Mountain, including our swinging bridge! What else is there to do at Foxfire Mountain? Ride on the only zip line in the Smokies that zips over a waterfall! Build your very own cairn for good luck with stones! We know you’ll love spending a day at Foxfire Mountain Adventure Park. The swinging bridge adventure does not require reservations, but we do recommend you make reservations for other activities, like zipline tours. 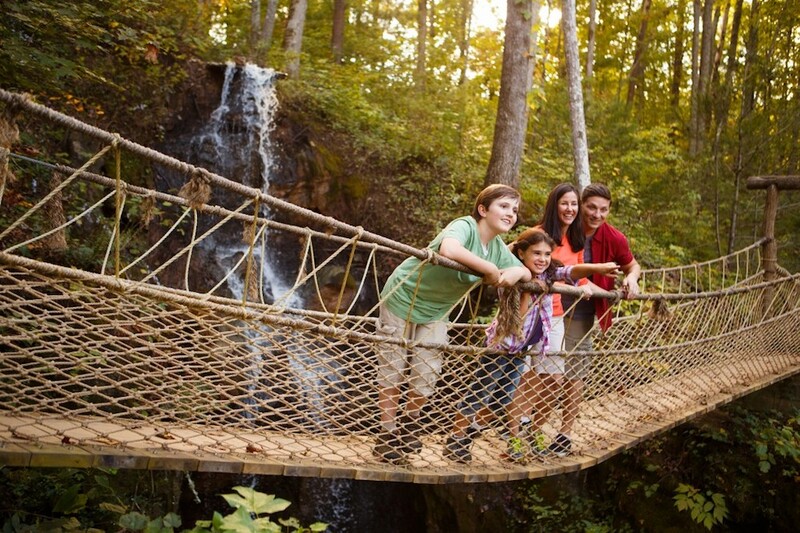 For more information about the Foxfire Mountain Swinging Bridge and all of the other fun things to do while you’re spending the day with us, click here.